HCM Tower Scholar Brian O’Donnell has gone on three mission trips to Mexico and South America. Most recently he traveled to Mexico City over fall break and worked with an organization called Hope for the Poor. The Tower Center sat down with Brian to hear about his experiences. Tell us about working with Hope for the Poor. 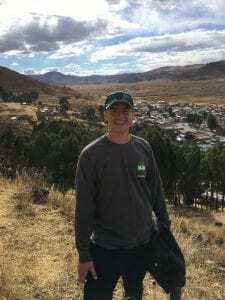 HCM Tower Scholar Brian O’Donnell in Peru. Hope for the Poor, founded by Craig Johring, works with three main communities in Mexico City. it’s a place of last resort for families if the father doesn’t want to turn to criminal activity to make money. The people living there scavenge for things they can sell. Craig goes there and brings food and sets up soccer for the kids. Another of the communities is homeless people living within a 10-block radius of the Shrine of Our Lady of Guadalupe, which is the main tourist attraction in the city. Craig also has a food cart for the people there and we helped distribute food to them. He keeps a list of all of the homeless people around to make sure that if someone disappears he can find out what happened to them. The third group lives at a women’s shelter that’s hardly even a shelter. It’s a state-run operation, and it’s basically a place where they round up anyone who is homeless so that they’re not on the street. Craig is the only person who visits the shelter from outside of the government and he brings basic things that the women normally wouldn’t have access to like shampoo bottles. He also talks to them since they don’t ever have people visit them. We spent a day at each of these communities and tried to understand these people’s lives. It was really eye-opening. What was visiting these communities like for you? You don’t see poverty like that very often. And it’s not that it doesn’t exist elsewhere, we could probably find it here in the U.S. too, but sometimes it requires going out of your comfort zone to see that. For me, it made me feel really thankful for all of the things that I have and for how nice everything is that we have at SMU. Having access to this education, we have a lot more opportunity than other people and that’s something I’m more thankful for now. It was also interesting because the dump and the shelter are both state-run operations, so it was seeing the effect of failed policies. He talked about how the shelter was supposed to retrain the people to be marketable for jobs so that they could move out of the shelter, but it ended up being just a holding cell for them and it hasn’t produced any of the results that the government intended it to. How did your background in policy from the Tower Scholars Program affect your experience? I was definitely going through the experience thinking about how the state could have done better, that there was someway they could fix this. I don’t know much about low-income housing policy, but I would imagine there has to be better alternatives to what they have now. But they have a lot of issues in Mexico City and this one gets forgotten. They don’t try to solve the homeless problem, they just try to keep them away from the main tourist sites because they don’t want the homeless to mess with the economic side of things. What other mission trips have you been on? I went to Peru for a month in July of 2016. We traveled to different places in Peru to work with the poor. That was another interesting case. Everyone overcrowds into the cities there because that’s the only place to get jobs, but there’s not enough housing to accommodate that. So there’s all these communities in the mountainside that are about as far away from the main part of the city as you can get while still being in the metro area, and it’s just a bunch of people who throw up whatever scrap metal they can find to build a house. They live there to have some sort of job since there’s no economy really out of the major cities. What drives you to go on these trips? Most of these trips are through Catholic organizations because my faith is a big part of my life. I do a lot of volunteering at the SMU Catholic Center and I have a few leadership roles there. The two trips in college were through the Catholic Center and I went to a Catholic high school, which organized a trip to Ecuador. It’s about serving the poor and trying to help them as much as possible. What do you think you takeaway from each mission trip, if anything? Obviously, I can’t be abroad all the time and doing those missions 24-7, and so I think that those missions have been an incredible experience. They mostly have opened my eyes to seeing people in my own life who are poor or are suffering in someway, how I can help them in my daily life. It just makes me more sensitive to people and more compassionate. I try and see ways that I can help people even if it’s small. I want to make other people’s lives better and I hope that I can do that in my job someday, whatever it is I end up doing after graduation. What’s the most important takeaway from the Tower Scholars Program? I never realized how much public policy applies to everything. I’ve realized that it’s important, but really there’s not a single thing that goes on in any part of life that doesn’t have some effect from government. After seeing all this — there’s a public policy arm to everything it seems like. Which is kind of cool because you can study it, and you think “Oh public policy majors are just going to be future government leaders.” But I’ve been able to utilize the program as a means of problem solving. The public policymaking process is something that can be applied to a lot of problem solving issues. That’s something I’ve talked about in interviews for jobs in finance. The mindset of being able to look at all possible alternatives and then assess all of the consequences, and decide which option is best — that’s applicable to everything.